Breeders say that in the next few years Russia could begin producing a new ecologically clean type of wheat with a high concentration of mineral elements for the world market. Scientists at the Nemchinovka Scientific Research Institute of Agriculture in Moscow, a well known scientific breeding center, have produced special kinds of winter wheat that are supposedly superior to existing analogues in terms of its healthy contents. They can grow in less fertile regions with cool climates and yet provide higher yields than those grown in more favorable conditions. The protein content in the new varieties is two times higher than most that exist on the world market. Breeders at Nemchinovka believe that new varieties of wheat will be able to solve a major agricultural problem: the quality of grain globally is on the decline. “Currently in the developed world the average yield of winter wheat is 90-100 hundredweights (a hundredweight equals approximately 45 kilograms) per hectare,” Bagrat Sandukhadze, a well-known breeder, and the head of the Laboratory of Winter Wheat Breeding at Nemchinovka, told RBTH. “What’s more its protein content is only 8-9 percent, which doesn’t make for good bread.” According to him, Nemchinovka varieties can produce 100-120 hundredweights per hectare with a protein content of 17 percent and a gluten content of 30 percent or more. Sandukhadze along with his colleagues has created 15 new varieties of winter wheat to grow in the “Nechernozemye” zone - a vast territory of the European part of Russia from the Arctic Ocean to the forest-steppe zone in the south from the Baltic Sea to western Siberia. Fourteen types have already obtained patents and copyright certificates. 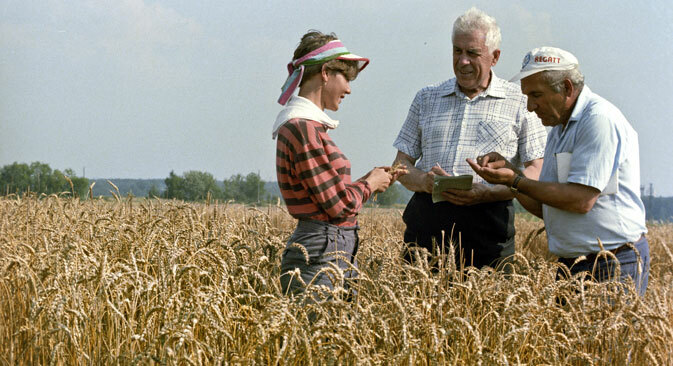 "The brilliant breeder Professor Sandukhadze can essentially provide quality wheat to feed the entire non-Black Earth region of Russia," says Valery Charushin, executive director of the Demidov Scientific Foundation and Chairman of the Ural Branch of the Russian Academy of Sciences. According to Margarita Shipitsyna, a member of the coordinating council of the Russian Guild of Bakers and Confectioners and director of research at Russian Recipe, genetically modified varieties today occupy about 70 percent of the world's fields. Experts believe that due to the high yield, new varieties will be a worthy "response to GMOs." Today, Russia is one of the six leading producers of wheat. The grain market is constantly changing, which requires strong new varieties. "Growing good varieties of food grains with strong genes allows you to save the environment and it is 10 times more profitable than investing in chemicals that stimulate growth or genetic engineering,” says Sandukhadze. “Professional selection is worth a maximum in the millions, yet technological factors lead to costs in the billions and degrade the environment. In Russia, there are 40 million hectares of vacant land, where you can grow a good eco-friendly grain and ensure the health of the nation." According to Shpitsyna, despite the success of breeders, Russia still has to solve a number of problems associated with the quality of the land. "In order to get a good healthy bread, Russia needs to revive quality control, which was systematically carried out in the Soviet era,” she says. “The quality of food grains in Russia has significantly decreased. There are new diseases in the grains." The breeding of new varieties has taken Sandukhadze 47 years. The project of breeding winter wheat in non-fertile zones with wet and cool climates was begun by Soviet breeders back in the 1930s. Sandukhadze already belongs to the third generation of researchers. The winter wheat varieties derived by Sanukhadze in recent years is now cultivated throughout Russia and abroad. The Moscow 39 variety is considered particularly unique and is sown in Canada, Austria, Turkey and other countries. "When this strain was tested at an international competition in Canada between 1999-2002, it was recognized as the best for its combination of high yield and grain quality,” explains Sandukhadze. “This wheat can grow in any weather due to its special genes and durability. It is frost-resistant, resistant to disease and has a unique grain quality and good baking qualities. For his record scientific achievements Sandukhadze received the prestigious Demidov Prize in February 2015. This marks the first time since this distinguished award’s inception in 1832 that it was given to a breeder.